If your looking for a unique Halloween decoration this pumpkin Halloween ghost is exquisitely crafted. 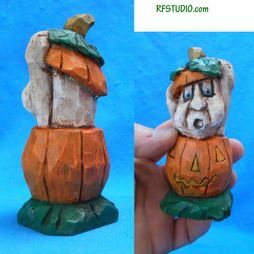 It is hand carved from basswood and painted in acrylic. Measures 2-1/2" x 2-1/2" x 4"h- from Basswood.